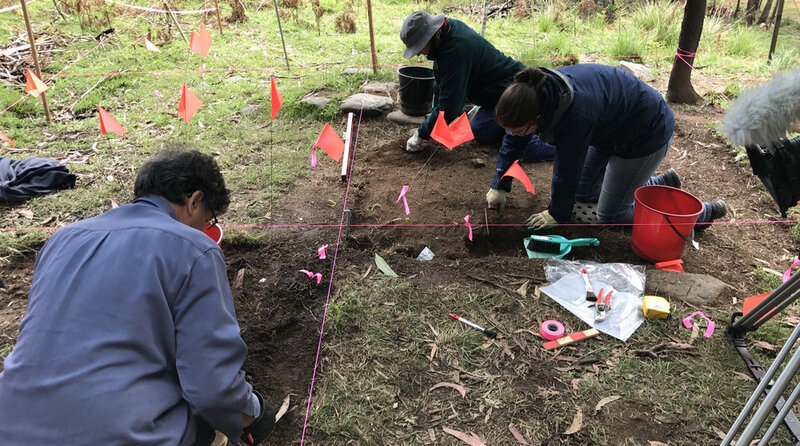 In October 2017, The Uncovered Past Institute conducted an excavation of a 19th century Chinese gold-mining village, in the Alpine National Park, in the Upper Ovens Valley, in northeast Victoria, Australia, near the town of Harrietville. The excavation took place over 3 weeks from 9 to 28 October, and was carried out by a team of nine specialists working with 36 members of the public from around Australia, who funded the excavation by paying to take part in the excavation, and to be trained in basic archaeological and cataloguing techniques. Permits for the excavation were obtained from Heritage Victoria, Parks Victoria and the Department of Environment, Land, Water and Planning (DELWP). The village, occupied from at least the early 1860s until the 1890s, occupies a number of benched levels created by the inhabitants, on sloping ground, 100 metres wide at its widest point, that follows the south bank of the East Branch of the Ovens River, for about 700 metres. Since being abandoned more than 100 years ago, it had become heavily overgrown, with only remnant traces of foundation stones occasionally visible under the vegetation. This was the first archaeological dig in Victoria of a Chinese mining settlement. The largely undisturbed site includes mine workings, water races, building foundations, and vegetable gardens: a rare survivor of the heyday of Chinese gold mining in Victoria. Four sites in the village were excavated - a possible dwelling site (designated as WC1 - West Camp 1) in the western end of the village, a mysterious stone feature set into a bank of earth (SF1 - Stone Feature 1) which expanded upon excavation into extensive stone flagging of a building’s floor, and two sections of a now-disused water race which once supplied water for the village and its vegetable gardens. Trenches dug into the water race demonstrated that it was substantial, almost half a metre deep, and would have provided abundant water for the residents’ domestic and garden use. The impervious nature of the subsurface clay means it would not have needed lining. A detailed survey of the whole village area by participants showed that there might be the remains of as many as 19 buildings on the site. This makes it one of the largest-known and best-preserved Chinese mining settlements in Victoria, possibly in Australia. In all, just over 2,300 archaeological fragments were discovered during the excavation. We retrieved 488 fragments of glass, 194 of Chinese ceramics, 156 of British and European ceramics, 748 nails, 577 other fragments of metal, 40 pieces of animal bone and 21 pieces of wood or charcoal. In the months since the excavation, our staff have been cataloguing, sorting and identifying and photographing all of these items. Most of the glass and ceramic fragments could be pieced together with others, and found to be different types of bottle, bowl, jar, cup, pipes and other items. So far, we have identified Chinese bowls, cups and ceramic spoons; ceramic jars that Chinese foods were bought in (such as pickles, preserved vegetables, soy sauce and oil); opium and tobacco pipes; European plates and cups; bottles for wine, beer and spirits; worcestershire sauce bottles; shards of window panes; shovels, a saw, and gold mining equipment; a wok stirrer and a camp oven; a pair of scissors, a sewing needle and eight buttons; and thirteen Chinese gaming tokens. The nails range from 1850s hand-forged ones to factory-made wire nails from later in the 19th century; many had been bent to form hooks. The oldest objects found were two small Chinese coins, dating from the era of the Kangxi Emperor in the 17th century. Such coins were minted by the millions, and remained in circulation for centuries after minting. Our team of specialists and dig-participants were delighted with the community support from Harrietville and across the Upper Ovens Valley during the excavation. We’d particularly like to thank the Harrietville Historical Society, the Harrietville Hall Committee, and the Harrietville Community Forum for their assistance with research, facilities, and spreading enthusiasm for the dig. We also greatly appreciated the warm hospitality of the various accommodation providers, cafes, caterers and hotels in the town who provided places for us to stay, food to eat, drinks to drink and nice places in which to relax after each day’s work. A full report on the 2017 excavation will be completed in early 2019, and we are currently planning a second season of excavations on the site, to be held in October 2019. If you’d like to take part in out next excavation at Harrietville, check the Season 2 page for updates, or ask to be on our email list.